Nothing says tropical like a Hibiscus flower sarong. 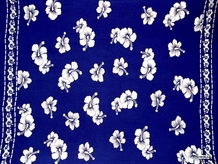 World renowned for its beauty, the Hibiscus flower comes in many different colors and sizes, just like our sarongs ;). Sarong measures approximately 66 x 44 inches (168 cm x 112 cm) on fringed lightweight rayon.